The Metrorail (or, more commonly, Metro) subway system is a clean, safe and reliable public transport system. Trains run from 5am Monday to Friday and from 7am on Saturday and Sunday. The system closes at midnight Sunday to Thursday and at 3am on Saturday and Sunday mornings, but the last trains from the suburbs may depart before that. Holiday schedules vary. At busy times, trains come as often as two minutes apart. But even if everything is running on time, the scheduled waits at nights and weekends can be up to 20 minutes. Metro lines can run deep and the escalators can be very long. The network is, however, wheelchair-accessible via elevators. If the elevators are broken at a particular station, a bus service will run from a nearby station. Fares depend on when and how far you travel and can almost double for some rides during rush hours. The minimum price of an off-peak Metro trip is $1.70, the maximum is $3.50; in peak hours journeys cost $2.10 to $5.75. Fares are printed on a big board on the information kiosk in each station. Note that using a paper farecard comes with a $1 surcharge per one-way trip. Up to two under-4s travel free with a full fare-paying adult; each additional child must pay full fare. Payment is by Farecard, SmarTrip® or Rail Pass. Insert your credit card or cash up to the value of $45 into a machine, this will then pop out a flimsy card with a magnetic stripe on the front. Use the card to enter and exit the Metro turnstiles. The price of each trip is subtracted and the remaining amount printed on the card until there’s not enough value left to go anywhere. You can then transfer the remaining amount to a new card using the same machines you buy cards from. You can’t get into the Metro without at least $1.70 on your card. If you don’t have enough to get out at a particular station, use the Exit Fare machines just before the exit turnstiles, which take only $1 or $5 bills. The farecard is usable only on Metrorail. This is a permanent, rechargeable plastic fare card like a credit card that can be purchased for $5 or $10 (with $5 value loaded), at kiosks at Metro stations, vending machines, commuter stores, retail outlets and online at www.wmata.com or www.commuterdirect.com. You can then top up the card with extra money. It is embedded with a special computer chip that keeps track of the amount available on the card. They are usable on either bus or Metro services and are cheaper and more flexible than other passes. A seven-day Fast Pass, valid for seven consecutive days, is available for $57.30. The SmarTrip is becoming the main, integrated system for Metro and buses as paper farecards are slowly phased out. For further information, contact SmarTrip Helpline: 1-888 762 7874. The One-Day Pass, $14, is valid for unlimited trips with no time restrictions. The seven-day, Short-Trip Pass, $35, is valid for seven consecutive days for trips costing up to $3.50 from 5-9.30am and 3-7pm weekdays; or for any trips at other times. 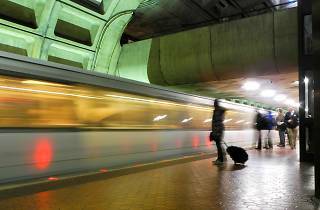 The seven-day Fast Pass, $47, is valid for seven consecutive days of unlimited Metrorail travel. Passes are sold at most Metro stations, online at www.wmata.com, some hotels and large grocery stores. This card offers unlimited Metrorail and Metro bus journeys for a month. 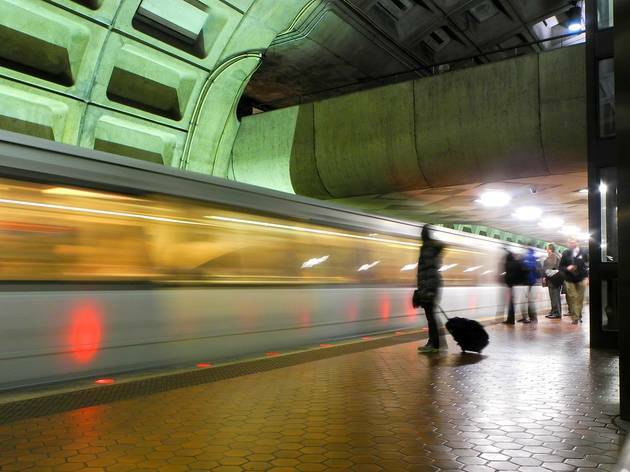 It also includes anywhere the Metro runs in Maryland, Virginia and the District of Columbia as well the use of Maryland and Virginia commuter rail lines. TLC cards are available online but not available at Metro Sales Offices. They cost $102. Red Line serves the Maryland suburbs north of DC and runs through the Downtown business district. The Zoo, Union Station and UDC (University of the District of Columbia) are on this line. Green Line serves Anacostia, the eastern National Mall area, Chinatown, the U Street district, Howard University and Columbia Heights. Blue Line serves Arlington, Alexandria, National Airport, the RFK Stadium and most Downtown memorials and museums. It parallels much of the Orange Line and some of the Yellow. Yellow Line serves Fairfax County (Virginia) via Alexandria to the Mall. Includes National Airport. Orange Line: serves the suburbs from western Virginia to eastern Maryland. Parallels the Blue Line through most major tourist sights. The bus system, also run by the Washington Metropolitan Area Transit Authority, covers the city well and is heavily used by locals. Bus stops are marked by three horizontal stripes in blue, white and red. A good timetable and route tool is available on the Metro website (www.wmata.com/timetables/default.cfm); though the most accurate way to track arrival times is through the online, GPS-based Next Bus service (www.wmata.com/rider_tools/nextbus). The greater Washington area is served by different local bus systems. Alexandria and Fairfax Counties in Virginia and Montgomery, Prince George’s and Prince William Counties in Maryland each run their own public transport or ride-share systems. To reach these services, call Metro (1-202 637 7000) for phone numbers and information. The bus fare system has changed from paper tickets and passes to SmarTrip cards, the prepaid top-up travel cards also used on Metrorail. The Metrobus fare for regular routes is $1.60 using SmarTrip or $1.80 using cash.The fare for express routes is $3.65 using SmarTrip or $4 using cash. Senior/Disabled fare is 75¢ for regular routes, $1.80 on express routes. The weekly seven-day regional bus pass costs $16 ($7.50 seniors and disabled), purchased online or at Metro Sales Offices. It is uploaded to your SmarTrip card and activated once you start to use the card. MARC is a commuter train running from Union Station to parts of West Virginia and Maryland (including Baltimore). The Penn line goes to Baltimore’s northern suburbs and runs from 4.45am to 11.40pm on weekdays (every 30 minutes during rush hour, every hour otherwise). It does not run at weekends. The Camden line stops at Camden Yards (Baltimore’s baseball stadium) and runs only during morning and evening rush hours (6.42-8.05am and 4.13-7.35pm). MARC stops at some Metro stations in Maryland. Fares between DC and Baltimore are $7 each way. Both Amtrak and MARC serve the BWI Airport station. There are no taxi ranks but you can usually find cabs outside hotels and it’s easy to flag down a DC-licensed cab around most central parts of the city. Cabs for hire have a light on top and the company name on the door. To call a cab in the District, try Diamond (1-202 387 2221, 6200) or Yellow Cab (1-202 544 1212). Cab fares are now metered based on how many miles you travel, with extra charges for additional passengers, rush-hour travel, calling for a cab and traveling during designated snow emergencies. Bear in mind when traveling during rush hour, that time consumed while the taxicab is stopped (or traveling at less than 10mph for longer than 60 seconds) is charged (an extra $15 per hour with Yellowcabs). Baggage charges are usually $1 for each fairly large, grocery-sized bag handled by the driver, after the first one, and $2.50 for each big bag. In reality, some cabbies charge, some don’t, depending, it seems, on their mood. To give an idea of cost, one person, flagging the cab, with no bags, not at rush hour nor in the snow, will probably pay $14-$15 plus tip to travel from Capitol Hill to Dupont Circle. In Maryland and Virginia, cabs also run on meters. Cabs licensed for these areas can legally only pick up fares in DC on a pre-arranged basis—and only take them to the jurisdiction in which they are licensed. That might be why, no matter how hard you’re waving on a DC street, that empty cab goes right on by.